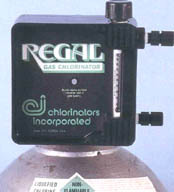 THE REGAL MODEL 210 CHLORINATOR IS A VACUUM-OPERATED, SOLUTION FEED TYPE, DESIGNED FOR MOUNTING DIRECTLY ON A CHLORINE CYLINDER VALVE BY MEANS OF A POSITIVE HEAVY DUTY YOKE CLAMP. 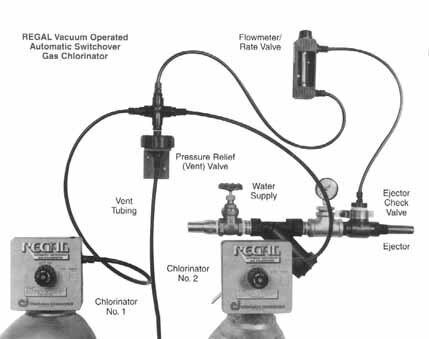 THE CHLORINE FLOW RATE IS MANUALLY ADJUSTED AND IS REGULATED BY A SPRING OPPOSED DIAPHRAGM REGULATOR WHICH ALSO CONTAINS THE SAFETY SHUT-OFF VALVE. VACUUM IS PROVIDED BY A HIGHLY EFFICIENT WATER OPERATED EJECTOR WHICH IS CLOSE COUPLED WITH THE CHLORINE SOLUTION DIFFUSER. THE EJECTOR ASSEMBLY CONTAINS A BACK FLOW CHECK VALVE. 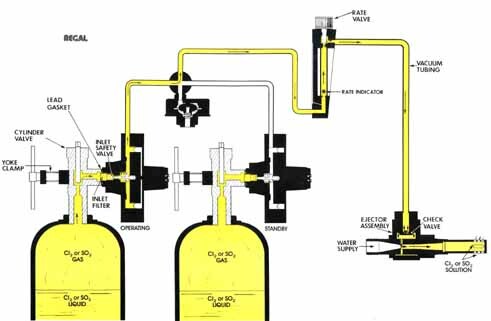 YELLOW COLOR INDICATES GAS FLOW IN THE MODEL 210 SINGLE CYLINDER CHLORINATOR. 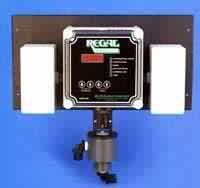 THE REGAL MODEL 216 AUTOMATIC SWITCHOVER GAS CHLORINATOR IS A VACUUM-OPERATED SYSTEM WHICH IS DESIGNED TO AUTOMATICALLY SWITCH THE CHLORINE FEED FROM AN EMPTY CYLINDER TO A FULL CYLINDER. 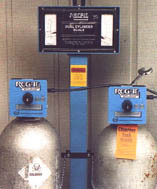 THE MODEL 216 IS DESIGNED FOR MOUNTING DIRECTLY ON A CHLORINE CYLINDER VALVE. IT IS A TOTALLY VACUUM OPERATED SYSTEM. THE SWITCHOVERS ARE SELF ACTUATING, ELIMINATING THE NEED FOR A SEPARATE SWITCHOVER MODULE. A SEPARATE GAS FLOW METER AND RATE CONTROL VALVE PANEL MAY BE LOCATED WHEREVER IT IS MOST CONVENIENT FOR THE OPERATOR AND CONNECTED BETWEEN THE VACUUM REGULATOR JUNCTION AT THE PRESSURE RELIEF (VENT)VALVE, AND THE EJECTOR, BY MEANS OF SAFE VACUUM TUBING. THE EJECTOR ASSEMBLY CONTAINS A BACK FLOW CHECK VALVE. 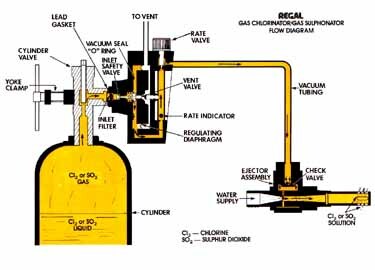 CHLORINE GAS FLOW RATE IS REGULATED BY A SPRING-OPPOSED DIAPHRAGM REGULATOR WHICH IS ALSO THE AUTOMATIC SAFETY SHUT-OFF VALVE. SHOULD VACUUM BE INTERRUPTED FOR ANY REASON ANYWHERE IN THE SYSTEM THE SAFETY SHUT-OFF/INLET VALVE IMMEDIATELY CLOSES, SHUTTING OFF THE CHLORINE SUPPLY FROM THE CYLINDER. A PRESSURE RELIEF VALVE DESIGNED TO "VENT" THE SYSTEM ALSO PROVIDES A CENTRAL INTERCONNECTION POINT FOR THE VACUUM TUBING. YELLOW COLOR INDICATES GAS FLOW IN THE MODEL 216 AUTOMATIC SWITCHOVER. THE REGAL SERIES 7000 SMARTVALVE IS A HIGHLY SOPHISTICATED FLOW PROPORTIONAL CONTROL VALVE, FOR USE WHEREVER CHLORINE OR SULFUR DIOXIDE IS NEEDED TO TREAT VARYING WATER FLOW RATES. THE VALVE CAN BE FACTORY-CONFIGURED TO OPERATE IN EITHER FLOW PROPORTIONAL OR STEP RATE CONTROL MODE. THE VALVE IS ALWAYS LINEAR WHEN DOSAGE IS SET AT 1:1, BECAUSE A UNIQUE "LINEARIZATION" PROGRAM IN THE MICROCONTROLLER COMPENSATES FOR TOLERANCE DIFFERENCES IN VALVE PLUGS, ROTAMETERS, COMPONENT PARTS, ETC. THE VALVE CAN BE OPERATED IN THE FIELD IN THE FULLY AUTOMATIC, ELECTRIC/MANUAL, AND TWO METHODS OF MANUAL. ADJUSTABLE "LOW FLOW" ALARM CIRCUIT, CONSISTING OF AN LED AND A RELAY ALERTS OPERATOR TO FLOW TRANSMITTER PROBLEMS. 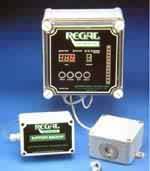 THE REGAL SERIES 3000 GAS LEAK DETECTOR (MONITOR) HAS MICROPROCESSOR BASED ELECTRONICS AND IS CAPABLE OF ACCURATELY SENSING AND DISPLAYING THE PRESENCE OF FREE CHLORINE OR FREE SULFUR DIOXIDE IN THE ENVIRONMENT AT LEVELS BELOW THOSE MANDATED BY OSHA THROUGHOUT THE WORKING LIFE OF THE SENSOR OR SENSORS USED. THE DETECTOR (MONITOR) ENCLOSURE IS NEMA 4X. THE SENSOR ENCLOSURE IS WATER TIGHT, UL APPROVED, AND RFI/EMI PROTECTED. 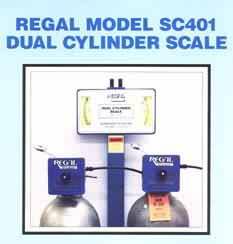 THE REGAL MODEL SC401 DUAL CYLINDER SCALE HAS TWO INDEPENDENT MECHANICAL SCALES IN ONE UNIT. EASY ON-SITE ASSEMBLY AND INSTALLATION. ADJUSTABLE CROSS-ARM WITH CHAINS TO SECURE CYLINDERS. 1 1/2" HIGH PVC BASE AND WEIGHING DISCS ELIMINATES CORROSION CAUSED BY SWEATING CYLINDERS. EASY TO READ 5"SCALE LENGTH WITH 150 GRADUATIONS ALLOWS FOR 1/2 LB. READABILITY. LET US KNOW ABOUT YOUR NEXT APPLICATION.